Price: Rs. 165 on Amazon. It had been a long time since I read a book. Time constraints and busy schedules left me with no time to indulge in my reading fantasies. But last week I got some time and hence applied to review this book. Honestly, when I read the gist of this book I thought it would be a nice breezy romance that will take my mind out of my work and stress. The book said it was a teenage love story and I immediately thought of it to be like one of those mills and boon kinda romance. After a few tiring months all I wanted was a simple love story to begin my reading spree. I thought this would fit the bill. The book came in soon enough. The cover looked interesting and so did the thought of the teenage romance. So last Saturday morning, I made myself a hot cup of green tea, some cookies and sat down to read this book. The main protagonist of this book is Mrityunjoy Roy, a fifteen year old boy who has spent two years at a Sainik school and has just returned to join his alma-mater DAV School in Shimla. Shimla is the second protagonist of this book as the author paints in vivid detail the beauty of this wonderfully famous hill station. The greenery, the wind, the snow; all of it comes to life due to the words of the author. Roy soon falls head over heels in love with Akanksha, his classmate and the most popular girl in school. Everything about her drives Roy crazy and soon he is all puppy eyed around her. Much to his surprise and happiness she even happens to join his Physics tuition and their friendship grows stronger. Thanks to the close proximity of the most popular girl with Roy, his friends envy him. Just as Roy is basking in his new found love and happiness, it all starts going down. Some sweet nothings later, the young love is plagued by misunderstandings and Roy experiences his first heart break. Later when Akanksha meets Neeraj in her dancing class and starts getting closer to him, Roy cannot take it. He still pines for her but things are not all smooth as they seem. Roy is soon depressed and is unable to focus on his career. He decides to let go of the past and move into a different city to concentrate on his career. But is it that easy to let go of something? Or someone? What his destiny has in store for him forms the rest of the story. The climax comes soon enough and is not how I expected it to be. 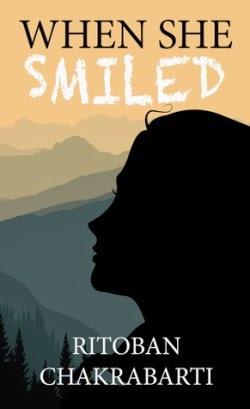 When She Smiled is the debut book of author Ritoban Chakrabarti. It is always good to read books from new writers as I myself am planning to write and release a book of my own soon. I appreciate the effort and the thought behind the emotions that is portrayed in the book, but hardly any effort is put in to the story line of the book. A single page story has been stretched into a whole book of 200 odd pages. The journey of young love from infatuation, to love, to heartbreak can show layers of emotion and the love can be portrayed so beautifully. But sadly this book does not do any of it. I honestly did not feel the innocence of the young love at all. It actually felt like a boring episode of some school romance serial. This book reminded me a lot of the serial 'Hip Hip Hurray' and the movie 'Rockford', but in a bad way. That show and that movie was brilliant, and they reminded me of all that the book was not. The story line is so bleak that apart from the picturesque Shimla, you cannot connect with anything else. The characters are poorly etched and do not have a well defined track. And the title holds no relevance to the story whatsoever. But in the end, it seems forcefully justified. The language used in the book is very bad with a large number of typos and grammatical errors. One or two issues in a book is fine, but when you find more than ten issues you realize that the language is of poor quality. I'm surprised that the editing team overlooked so many issues. There are a few books in which either the starting is good, or the middle if good, or the ending is good. But no part of this book is good. The ending is abrupt and disappointing. The climax holds no surprise and the pace of the book is staggering. I could have crawled a good hundred kilometers and yet the story would still remain at the same point. Clearly, this one was not the book through which I should have come back to reading. A very poor choice from my end. Verdict: Slow and boring. Not even for a one time read. That's a pretty bad rating...i agree, at least typos and grammatical errors should not be there. I won't even touch this book. Welcome Naba, do not go near this book. What a shame the writing was so poor! Sounded promising as a plot. I appreciated reading your review. Hope you find another book more worthy of your precious time. Thanks for sharing. The plot seemed promising to me too. Exactly why I signed up for it. But then, sadly it was not worth it. It's disappointing to read such books. I feel there is still a lack of quality indian fiction compared to our western counterparts. i have read only not-so-good reviews for this title. sadly the market is flooded with such titles.